Flamenco Performance in Seville, Spain. The travelers spent the day in Seville, touring the city and the Alcazar, founded in the 11th century as a Moorish fortress. Tonight we enjoyed Andalusian Flamenco Dancers. The music is Arabic for the most part but has hints of Greek and Jewish chants. 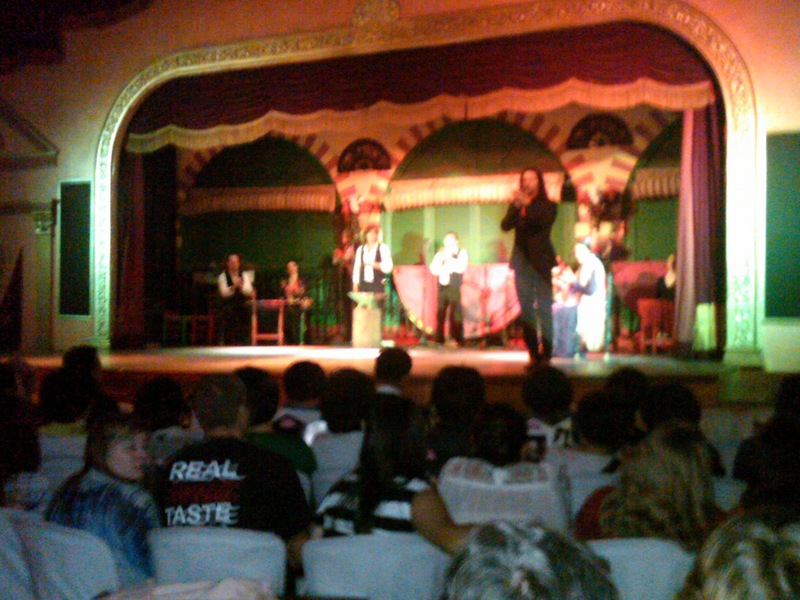 Overall, flamenco is a combination of music, singing, and dance. Hand-clapping was the flamenco's original instrument until the guitar entered the picture. Castanets are also used; the castanet is usually fastened on the hand by the thumb or any combination of fingers so that the wrist can snap it quickly and make the sound. Red, black, and white are dominant colors used in the distinct costuming worn by the performers. Another very full day has come to an end. We're off tomorrow on our return journey to Madrid. The ECC travelers head home on Sunday morning.